This outfit totally makes me think of Thanksgiving. In fact, I almost wish I would have saved it for the occasion, but alas I wore it on this day instead. 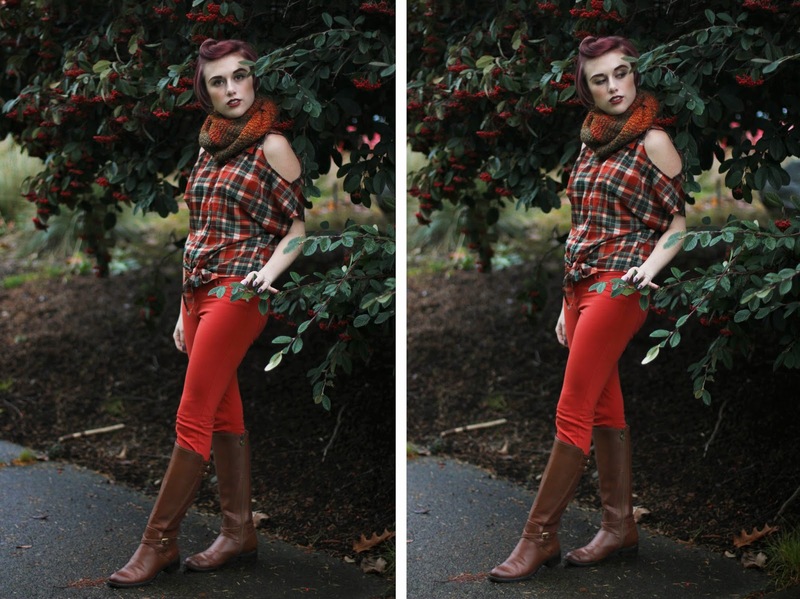 Maybe this can serve as some nice festive inspiration for anyone in search of a comfy, yet cute, turkey day outfit? Either way, I love how these colors all played on each other and the whole look was quite matchy-matchy, without being too crazy looking. I borrowed the scarf from Michael, but since I made it in the first place, I figured we had joint-custody over it, haha. Sorry for the total photo overload, but I just love how these turned out! I actually took one of these photos and turned my hair it's natural color via a color sample from my roots, and it was so strange seeing my hair the way it is without and color in it! The really funny thing is, is that I actually really liked it! My hair hasn't been it's natural color since I was in 9th grade, which is pretty insane when I think about it. For so long I completely resented the shade of mousey brown that is way, and once I had it dyed for the first time, I decided to never go back. The closest I've ever been is a very dark brown, but now it finally feels like time to go back. If you're curious at all, I stuck a photo of it on Twitter. I hope everyone has a really fantastic Thanksgiving! Your hair looks gorgeous, and I love these colors on you. I actually have this top, too! Well thank you! And it's an iffy top for me! I can never quite make up my mind as to how I feel about it, haha. I love reading all your posts and admiring your wonderful fashion taste and eclectic style. Your blog posts are lovely! I love your hair as well! I blog as well, and you are certainly an inspiration.